I’m a sucker for anything kawaii. Stick a cute face on a character and I’ll fall for it. There used to be a Morning Glory very close to my middle school and I used to spend all of my lunch money there on Monday only to starve the rest of the week. The call of the stuffed animals, sticker pictures and stationary was too hard to resist. Many years later, I’m proud to say I quit my Morning Glory addiction but I still have moments of weakness for adorable things. 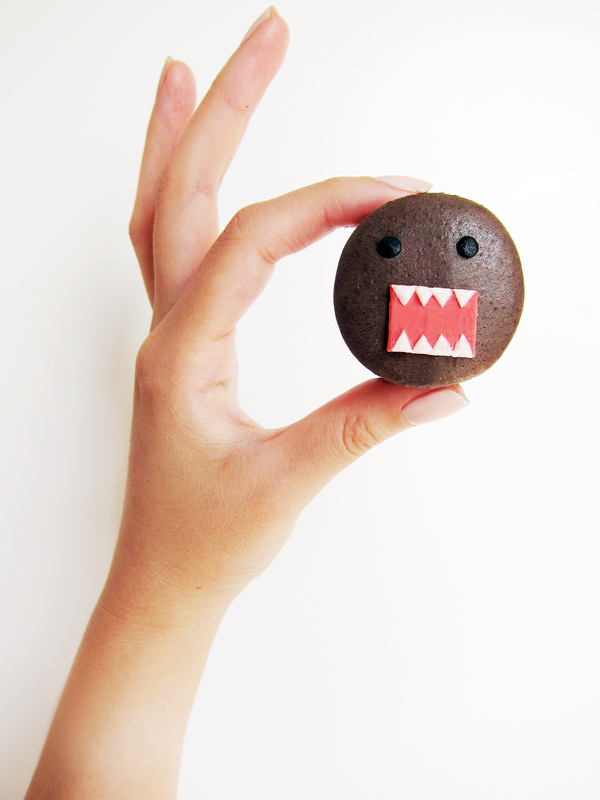 The first time I laid my eyes on Domo-Kun I fell in love. The round beady eyes and his wide mouth with his sharp little teeth won me over instantly. And when I thought of decorating a chocolate macaron, I figured that his simple yet distinctive face would be perfect for it. Roll out black fondant thinly and using the end of a thin straw or a small, plain round pastry tip punch out little black circles for eyes. After punching it out, slightly push the circles down to flatten and smooth out the edges. Roll out red fondant thinly, and using a pastry wheel or a sharp knife, cut out ½ in. 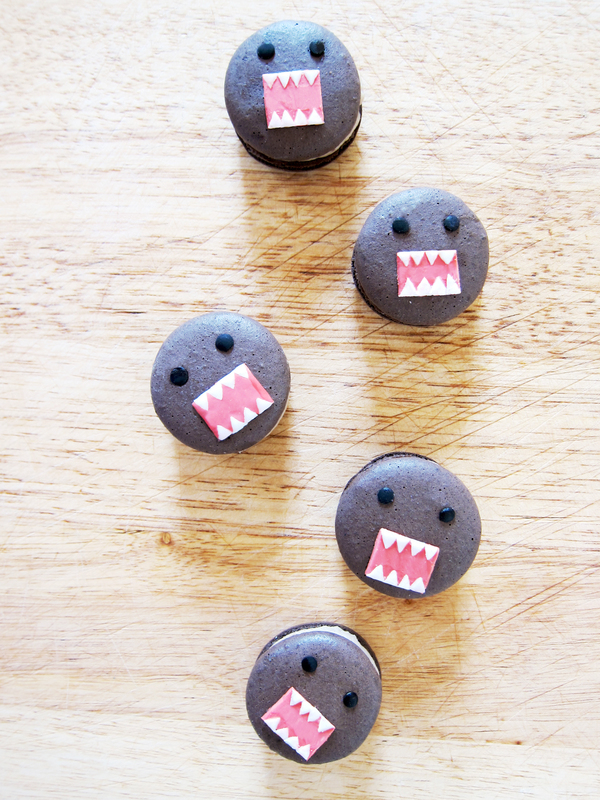 rectangles for Domo’s mouth. Roll out white fondant and using a pastry wheel or a sharp knife, cut out thin strips of white fondant. Then cut triangle shaped teeth by running the pastry wheel diagonally cross the rectangle. Let fondant pieces dry out for an hour or more to firm up. Take four “teeth” and attach it to the red rectangle by using a thin paint brush to moisten the edges with water. Place black eyes on the top quarter of the macaron and attack the completed mouth to the bottom half. In the bowl of a food processor, add the almond meal, cocoa powder and powdered sugar and pulse until thoroughly combined. Sift the mixture over a large mixing bowl, throwing out the lumps as they appear. Add 82 g. of the egg whites and stir until you get a thick paste. Once the syrup reaches 200˚F, start whipping the remaining 90 g. of egg whites with a generous pinch of sugar in the bowl of your stand mixer with the whisk attachment on medium speed until soft peaks form. Once the syrup reaches 248 degrees, remove the pot off the heat and slowly pour the syrup down the side of the mixing bowl with the egg whites on medium speed. Once the egg whites are fully incorporated, increase the speed to medium high until egg whites form glossy, stiff peaks. Add two drops of the yellow gel food color and mix until batter turns a light shade of yellow. The piped batter may have peaks but should smooth away in a minute or two. Let the batter stand until the tops of the macaron batter are dry to the touch, about 30 mins to 1 hour. Preheat the oven to 275-325˚F. If your oven tends to run hot go for 275˚, if not then 325˚. In a medium saucepan, bring milk and ¼ c. sugar to a boil. In another medium bowl, mix egg yolks, egg, cornstarch and ¼ c. sugar until a paste forms. Using a ladle, drizzle a ladleful of milk while continuously whisking the egg mixture. Continue to drizzle in hot milk a little at a time until you mix in ¾ of the milk. Take the egg milk mixture and pour it into the saucepan with the remaining milk. Cook the mixture while stirring constantly over medium heat until mixture is thickened and pudding like. Remove saucepan from heat and mix in butter and vanilla extract. Set aside. In a food processor, puree chestnuts until very fine. Add the pastry cream and process until a smooth paste forms. Add the heavy whipping cream and process until completely mixed in. 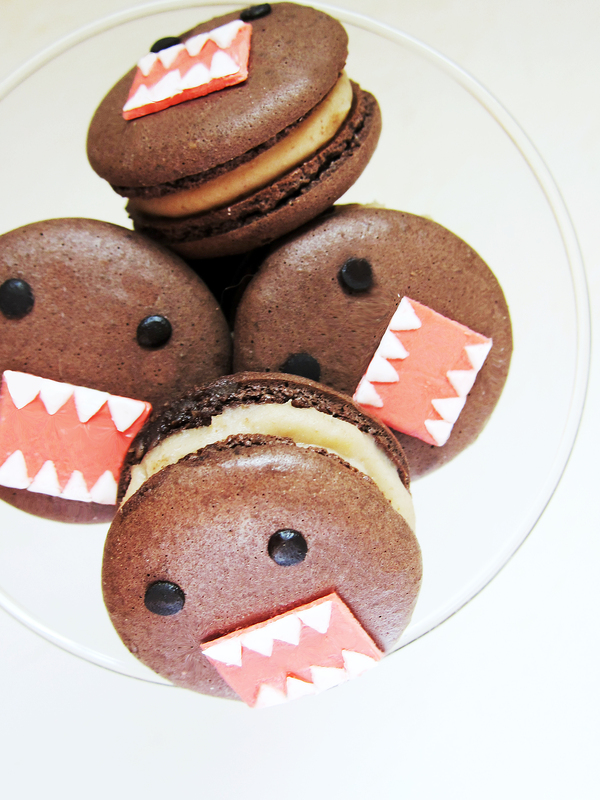 This entry was posted in Chocolate, Cookies, Desserts, Macarons and tagged chocolate, Cute, domo, domo kun, japanese, macaron. Bookmark the permalink. So cute! I love macaroons but haven’t attempted making them yet. But think this could also work on chocolate cupcakes. These are properly adorable! And I love the chocolate chestnut macaroon recipe. Faces on sweets weird me out a little most of the time, but for chocolate and chestnut macaroons I might be persuaded! Thank you 🙂 I agree with the faces on food! One time my exboyfriend got me m&ms with our faces on it and it felt really weird eating them.